Greetings in the day of Balance ... You can accept is a Green-day because related to Mercury planet, the ruler of Finance ... but is indeed a day of Balance. Balance means before everything ... "As Above, So Below" ... and if here is like Above ... We are in Heaven. Now ... let me excuse for my tone (provocative) about Grape or Wine and Dinosaurs ... They are not original from here ... but because the Melody have changed ... I prefer do not disturb your Mind ... but talk about Healing. Now ... 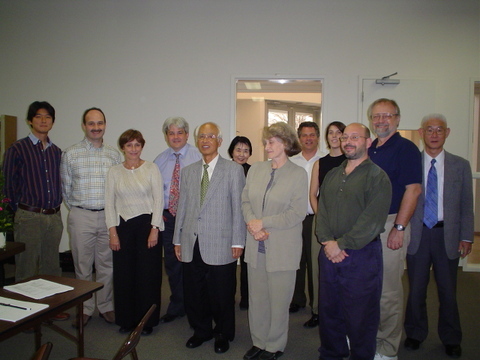 I got the opportunity to meet and attend ... Dr. Motoyama Speech in Encinitas, CA ... in 2005. I ask many persons ... including my Western Doctor if I look younger today in 2017 ... after 12 years ... than in the Picture. All agree, I AM younger today. Clarified ... with a more Ironic strategy ... and The Music of Irony help healing ... We can try to draw a view to the Avenue ... Where the Eastern Medicine is on the Right side ... and the Western Medicine is on the left Side. How the Meridians were discovered in the East ... is for me a posted question ... not necessarily fruit of Empiricism. May be fruit of channeling ... because also the East channel and Dr. Motoyama, like a Shinto Priest did ... and did Well ... He were able to tell you your Past Lives (See his Book, "Karma and Reincarnation"). The approach of Healing in Western Medicine is completely different than in the East. In fact, West is more "Car-repair"-like ... but works. The Motor of Heart does not work? ... Replace! ... Veins are blocked ... clean them ... The Human Body is considered like a Machine to be fixed. The Human Body is Electro-Magnetic ... The Body is like an electromagnet where the iron core is wrapped with coils of wire through which a current is passed. Now, Dr. Motoyama draw on paper and move to a Computer this ... current. He prove it and this current is the Ki (in Japanese), or Chi in Chinese or Ka in Old Egyptian. Now the difference here is to talk a little bit ... about the EEG related to the Heart and Heart as a Chakra ... by example, because there are an Abyss between the Cultures ... and the West need the East and the East need the West. In fact, in popular Dr. Motoyama book, "Science and the Evolution of Consciousness" ... Dr. Motoyama Scholar of Hindu Philosophies talk about some Guru in India, able to let their Heart pulsate at 300 beats per minute. (I, Giovanni propose you remain below 50 beat per minute ... or around 60). Remain calm. She (and I not so far) will teach you to align or Balance your DNA ... in few days. In a somehow ... Tai Chi Wave she align the first Twelve DNA layers in a single day. She is a Master and she is from United States, not Japanese, not Indian Guru, not Russian ... this prove that any Latitude have Masters. The AMI data is used to prevent and Study the Allergic Rhinitis ... and other cases. I cannot but comment about Italy ... and Dr. Muti has evolved a "channeled" apparatus ... that do not measure or capture data ... but heal. It works with the Brain ... and let the Brain produce the Appropriate Waves to heal a determinate Organ ... The Apparatus stimulate the Brain according to your needs. PS. The Builder of Man that transform the Monkey into a Homo Erectus ... were the same ... bring us the Grape and the Dinosaur Eggs for the first time ... Our Fathers, the Annunaki. Thanks. PPS. If the information is not too much ... is because for now ... we prefer give small glimpses ... instead to give definitive books.